Survey work in San Mateo del Mar, Oaxaca, Mexico. My primary fields of interest are applied econometrics and development economics. Below you can read a brief description of my dissertation research, other projects I am currently working on, and projects I have worked on in the past. For my dissertation, I analyzed the dynamic and strategic migration decision-making behavior of households and individuals in rural Mexico using reduced-form models and structural econometric modeling. The migration decisions of households in a village and of individuals in a household can be thought of as a dynamic game in which each household or individual optimally decides how to allocate its resources across distinct activities, with dynamic considerations about the future and strategic considerations about what other players in the village or in the household are doing. Neighborhood Effects in Migration Decisions in Rural Mexico. 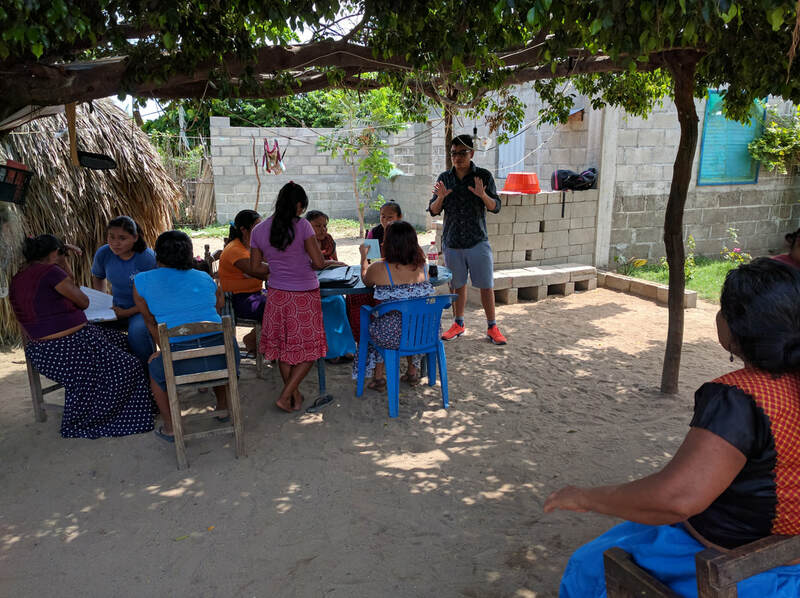 Intra-Household Migration Games in Rural Mexico​ (work in progress). In ongoing work, we are designing and implementing a field experiment to induce exogenous shocks on the three components of hope: aspirations, pathways and capabilities. The field experiment includes a documentary showing successful experiences of a micro-finance users, and a goals fixation exercise from a faith-based curriculum. We are partnering with Fuentes Libres, a micro-finance organization in Oaxaca, Mexico. We are evaluating the treatment effect on psychological and business performance outcomes, on measures of spiritual health, and on savings and loans demand. In another project, we analyze whether the economic behavior of the poor differs in the presence of anticipated and unanticipated income shocks using data from 3,000 low-income households who receive transfers from PROSPERA, Mexico's conditional cash transfer (CCT) program. We randomly interviewed beneficiaries who have received a transfer in the last 1 to 7 days and beneficiaries who are about to receive a transfer within a week, thus generating exogenous variation in CCT delivery dates. Similarly, we compare households that suffered a job or health shock in the past 2 weeks with households that experienced this shock in the past year. I have worked on several other research projects as a Master's and Ph.D. student, and also in consulting. As a Ph.D. student, I have worked with a team of researchers from UC-Davis and the World Food Programme in a project to evaluate the effects of the switch in aid regime from in-kind aid to cash in refugee camps in Rwanda. I participated in the survey design, the fieldwork, and the data analysis that resulted in peer-reviewed publications in the Proceedings of the National Academy of Sciences and in World Development. For my Master's thesis, I estimated the intergenerational elasticity of income in Mexico using a two-sample two-stage least squares estimator (TS2SLS) and a pseudo panel, combining data from a national representative survey on social mobility of the year 2011 and the national household income and expenditures survey of the year 1992. I estimated an intergenerational elasticity ranging from 0.31 to 0.54 using the TS2SLS estimator, and of around 0.60 with the pseudo panel. These estimates suggest a higher level of social mobility with respect to other Latin-American countries with comparable studies. My Master's thesis was published as a chapter in a book on Social Mobility in Mexico. While a Master's student, I also worked on a project to study whether married females’ income equalized the total family income distribution in Mexico during the 1988-2010 period. We investigated several counterfactuals and concluded that increased female employment has contributed to a decline in family income inequality through higher married females’ labor participation in poor families. This project resulted in a paper published in the Latin American Journal of Economics. As a consultant, I have worked for the Inter-American Development Bank (IDB) in the Trade and Integration Sector analyzing data on trade and transportation routes in Chile and Colombia. I have also worked consulting the Food and Agriculture Organization of the United Nations (FAO) on a project to evaluate the local effects of extension on agricultural development in Zambia. For publications that have resulted from my previous research, see my Publications.